Update note: Michael Katz updated this tutorial for Xcode 10.1, Swift 4.2, and iOS 12. Audrey Tam wrote the original. Writing tests isn’t glamorous, but since tests keep your sparkling app from turning into a bug-ridden piece of junk, it’s necessary. If you’re reading this tutorial, you already know you should write tests for your code and UI, but you may not know how. You may have a working app, but you want to test changes you’re making to extend the app. Maybe you already have tests written, but aren’t sure whether they’re the right tests. Or, you have started working on a new app and want to test as you go. Along the way, you’ll pick up some of the vocabulary used by testing ninjas. Before writing any tests, it’s important to know the basics. What do you need to test? If your goal is to extend an existing app, you should first write tests for any component you plan to change. Fast: Tests should run quickly. Independent/Isolated: Tests should not share state with each other. Repeatable: You should obtain the same results every time you run a test. External data providers or concurrency issues could cause intermittent failures. Self-validating: Tests should be fully automated. The output should be either “pass” or “fail”, rather than rely on a programmer’s interpretation of a log file. Timely: Ideally, tests should be written before you write the production code they test (Test-Driven Development). Start by downloading the project materials using the Download Materials button at the top or bottom of this tutorial. There are two separate starter projects: BullsEye and HalfTunes. BullsEye is based on a sample app in iOS Apprentice. 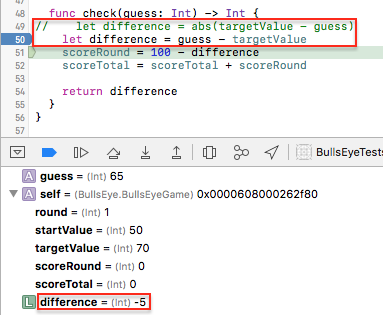 The game logic is in the BullsEyeGame class, which you’ll test during this tutorial. HalfTunes is an updated version of the sample app from the URLSession Tutorial. Users can query the iTunes API for songs, then download and play song snippets. The Test navigator provides the easiest way to work with tests; you’ll use it to create test targets and run tests against your app. Open the BullsEye project and press Command-6 to open the Test navigator. Accept the default name, BullsEyeTests. When the test bundle appears in the Test navigator, click to open the bundle in the editor. If the bundle doesn’t appear automatically, troubleshoot by clicking one of the other navigators, then return to the Test navigator. The default template imports the testing framework, XCTest, and defines a BullsEyeTests subclass of XCTestCase, with setUp(), tearDown(), and example test methods. Product ▸ Test or Command-U. Both of these run all test classes. Try the different ways to run tests to get a feeling for how long it takes and what it looks like. The sample tests don’t do anything yet, so they run really fast! You don’t need testPerformanceExample() or testExample() for this tutorial, so delete them. 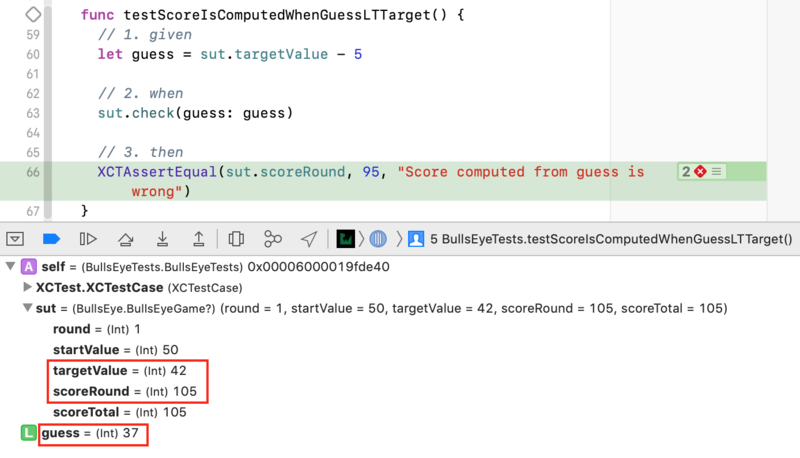 First, you’ll use XCTAssert functions to test a core function of BullsEye’s model: Does a BullsEyeGame object correctly calculate the score for a round? 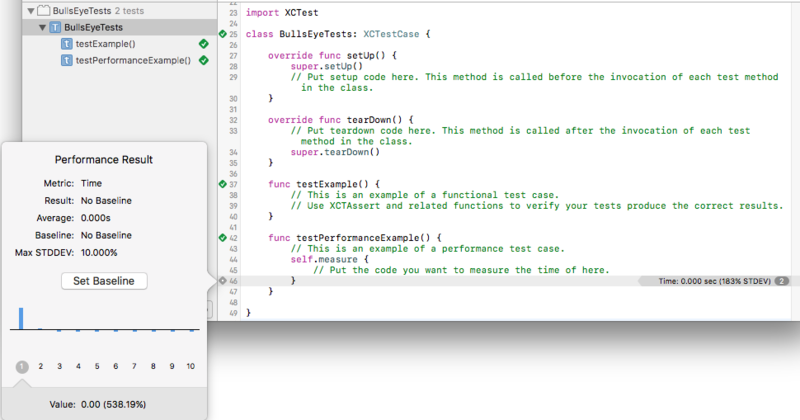 This gives the unit tests access to the internal types and functions in BullsEye. This creates a placeholder for a BullsEyeGame, which is the System Under Test (SUT), or the object this test case class is concerned with testing. This creates a BullsEyeGame object at the class level, so all the tests in this test class can access the SUT object’s properties and methods. Here, you also call the game’s startNewGame(), which initializes the targetValue. Many of the tests will use targetValue to test that the game calculates the score correctly. Note: It’s good practice creating the SUT in setUp() and releasing it in tearDown() to ensure every test starts with a clean slate. For more discussion, check out Jon Reid’s post on the subject. Now, you’re ready to write your first test! Given: Here, you set up any values needed. In this example, you create a guess value so you can specify how much it differs from targetValue. When: In this section, you’ll execute the code being tested: Call check(guess:). Then: This is the section where you’ll assert the result you expect with a message that prints if the test fails. In this case, sut.scoreRound should equal 95 (100 – 5). Run the test by clicking the diamond icon in the gutter or in the Test navigator. This will build and run the app, and the diamond icon will change to a green check mark! There’s a bug built into BullsEyeGame on purpose, and you’ll practice finding it now. To see the bug in action, you’ll create a test that subtracts 5 from targetValue in the given section, and leaves everything else the same. In the Breakpoint navigator, add a Test Failure Breakpoint. This will stop the test run when a test method posts a failure assertion. Run your test, and it should stop at the XCTAssertEqual line with a test failure. The problem is that difference is negative, so the score is 100 – (-5). To fix this, you should use the absolute value of difference. In check(guess:), uncomment the correct line and delete the incorrect one. Remove the two breakpoints, and run the test again to confirm that it now succeeds. Now that you’ve learned how to test models and debug test failures, it’s time to move on to testing asynchronous code. Open the HalfTunes project. It uses URLSession to query the iTunes API and download song samples. Suppose you want to modify it to use AlamoFire for network operations. To see if anything breaks, you should write tests for the network operations and run them before and after you change the code. URLSession methods are asynchronous: They return right away, but don’t finish running until later. To test asynchronous methods, you use XCTestExpectation to make your test wait for the asynchronous operation to complete. All the tests in this class use the default URLSession to send requests to Apple’s servers, so declare a sut object, create it in setUp() and release it in tearDown(). expectation(description:): Returns an XCTestExpectation object, stored in promise. The description parameter describes what you expect to happen. promise.fulfill(): Call this in the success condition closure of the asynchronous method’s completion handler to flag that the expectation has been met. wait(for:timeout:): Keeps the test running until all expectations are fulfilled, or the timeout interval ends, whichever happens first. Run the test. If you’re connected to the internet, the test should take about a second to succeed after the app loads in the simulator. Failure hurts, but it doesn’t have to take forever. Run the test. It fails, but it takes the full timeout interval! This is because you assumed the request would always succeed, and that’s where you called promise.fulfill(). Since the request failed, it finished only when the timeout expired. You can improve this and make the test fail faster by changing the assumption: Instead of waiting for the request to succeed, wait only until the asynchronous method’s completion handler is invoked. This happens as soon as the app receives a response — either OK or error — from the server, which fulfills the expectation. 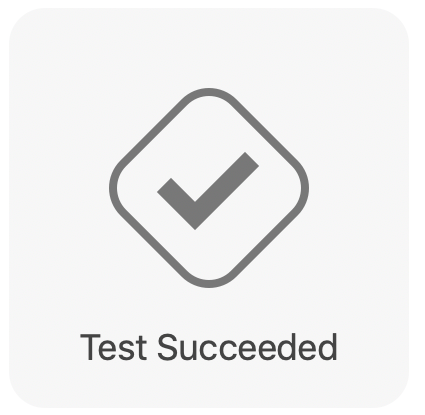 Your test can then check whether the request succeeded. To see how this works, create a new test. But first, fix the previous test by undoing the change you made to the url. The key difference is that simply entering the completion handler fulfills the expectation, and this only takes about a second to happen. If the request fails, the then assertions fail. Run the test. It should now take about a second to fail. It fails because the request failed, not because the test run exceeded timeout. Fix the url, and then run the test again to confirm that it now succeeds. Asynchronous tests give you confidence that your code generates correct input to an asynchronous API. You might also want to test that your code works correctly when it receives input from a URLSession, or that it correctly updates the user’s defaults database or an iCloud container. Employ fakery when your code has a dependency on a system or library object. You can do this by creating a fake object to play that part and injecting this fake into your code. Dependency Injection by Jon Reid describes several ways to do this. In this test, you’ll check that the app’s updateSearchResults(_:) correctly parses data downloaded by the session, by checking that searchResults.count is correct. The SUT is the view controller, and you’ll fake the session with stubs and some pre-downloaded data. 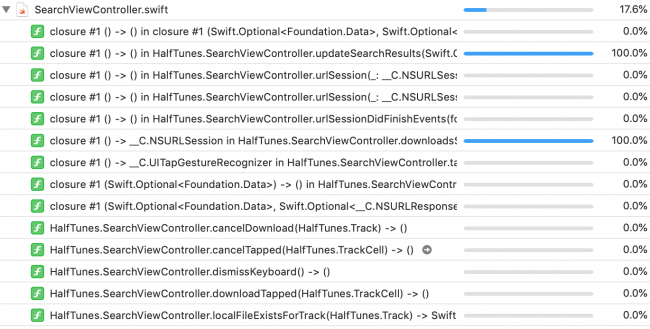 Note: The SUT is the view controller, because HalfTunes has a massive view controller problem — all the work is done in SearchViewController.swift. Moving the networking code into a separate module would reduce this problem and, also, make testing easier. Copy this URL and paste it into a browser. This downloads a file named 1.txt, 1.txt.js or similar. Preview it to confirm it’s a JSON file, then rename it abbaData.json. Now, go back to Xcode and go to the Project navigator. Add the file to the HalfTunesFakeTests group. 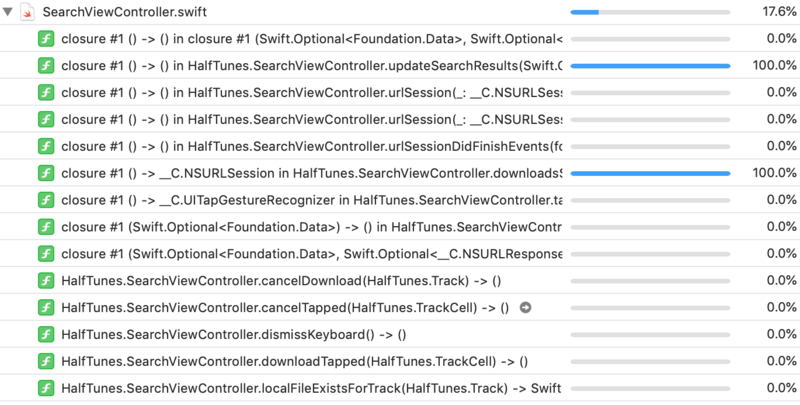 The HalfTunes project contains the supporting file DHURLSessionMock.swift. This defines a simple protocol named DHURLSession, with methods (stubs) to create a data task with either a URL or a URLRequest. It also defines URLSessionMock, which conforms to this protocol with initializers that let you create a mock URLSession object with your choice of data, response and error. This sets up the fake data and response and creates the fake session object. Finally, at the end, it injects the fake session into the app as a property of sut. The when assertion is that searchResults is empty before the data task runs. This should be true, because you created a completely new SUT in setUp(). Run the test. It should succeed pretty quickly because there isn’t any real network connection! Reopen the BullsEye project. The app has two game styles: The user either moves the slider to match the target value or guesses the target value from the slider position. A segmented control in the lower-right corner switches the game style and saves it in the user defaults. Your next test will check that the app correctly saves the gameStyle property. MockUserDefaults overrides set(_:forKey:) to increment the gameStyleChanged flag. Often, you’ll see similar tests that set a Bool variable, but incrementing an Int gives you more flexibility — for example, your test could check that the method is called only once. This creates the SUT and the mock object and injects the mock object as a property of the SUT. The when assertion is that the gameStyleChanged flag is 0 before the test method changes the segmented control. So, if the then assertion is also true, it means set(_:forKey:) was called exactly once. UI testing lets you test interactions with the User interface. UI testing works by finding an app’s UI objects with queries, synthesizing events, and then sending the events to those objects. The API enables you to examine a UI object’s properties and state in order to compare them against the expected state. In the BullsEye project’s Test navigator, add a new UI Test Target. Check that the Target to be Tested is BullsEye, and then accept the default name BullsEyeUITests. This opens the app in the simulator in a mode that records your interactions as test commands. Once the app loads, tap the Slide segment of the game style switch and the top label. 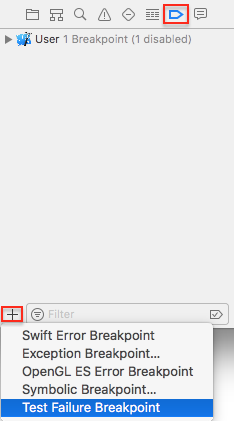 Then, click the Xcode Record button to stop the recording. The Recorder has created code to test the same actions you tested in the app. Send a tap to the slider and the label. You’ll use those as a base to create your own UI test. If you see any other statements, just delete them. The first line duplicates the property you created in setUp(), so delete that line. You don’t need to tap anything yet, so also delete .tap() at the end of lines 2 and 3. Now, open the little menu next to ["Slide"] and select segmentedControls.buttons["Slide"]. This checks to see whether the correct label exists when you tap() on each button in the segmented control. Run the test — all the assertions should succeed. It’s very simple to write a performance test: You just place the code you want to measure into the closure of the measure(). 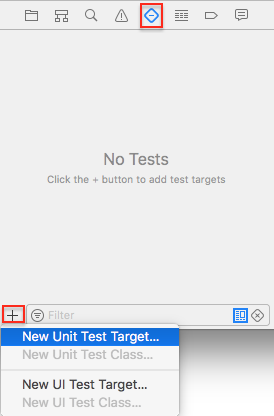 Run the test, then click the icon that appears next to the beginning of the measure() trailing closure to see the statistics. Click Set Baseline to set a reference time. Then, run the performance test again and view the result — it might be better or worse than the baseline. The Edit button lets you reset the baseline to this new result. Any time you make changes to an app that might impact the performance of the method being tested, run the performance test again to see how it compares to the baseline. The code coverage tool tells you what app code is actually being run by your tests, so you know what parts of the app code aren’t (yet) tested. Scroll down to updateSearchResults(_:) to see that coverage is 87.9%. The coverage annotations show how many times a test hits each code section; sections that weren’t called are highlighted in red. As you’d expect, the for-loop ran 3 times, but nothing in the error paths was executed. To increase coverage of this function, you could duplicate abbaData.json, then edit it so it causes the different errors. For example, change "results" to "result" for a test that hits print("Results key not found in dictionary"). How hard should you strive for 100% code coverage? Google “100% unit test coverage” and you’ll find a range of arguments for and against this, along with debate over the very definition of “100% coverage”. Arguments against it say the last 10-15% isn’t worth the effort. Arguments for it say the last 10-15% is the most important, because it’s so hard to test. Google “hard to unit test bad design” to find persuasive arguments that untestable code is a sign of deeper design problems. You can download the completed version of the project using the Download Materials button at the top or bottom of this tutorial. Continue developing your skills by adding additional tests of your own.